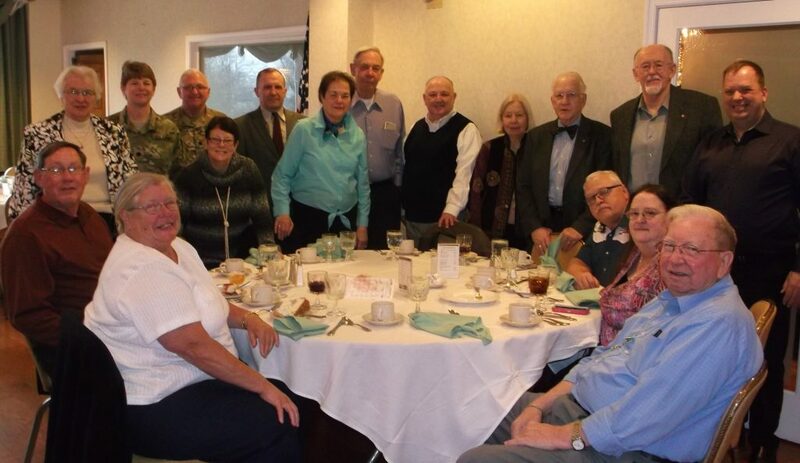 Dear Friends in Chaplaincy – What a marvelous gathering for lunch on Tuesday, 23 Feb at the Fort Myer Officers’ Club. We were welcomed by Senior Garrison Chaplain (LTC) Mark Jones who greeted all attending and offered our invocation prayer. Also, his spouse Chaplain (LTC) Carron Jones who served in the office of the Army Deputy Chief of Chaplains joined us. You’ll see many familiar faces in the circle, including a number of “first time” attendees. Also, we had a number of regulars apart from us whom we remembered in prayer: Donna Weddle (in her winter home in Arizona), Jeff and Monika Young (supporting Jeff’s sister and family during surgery), David and Janice Hicks (while Dave recovers from a recent stroke), Wayne Lehrer (doing final preparation for the 25th anniversary gathering after Desert Storm of the VII Corps in Washington DC), Doug Lee (traveling) and Benchuck and Carolyn Manning. Plans are for a Spring luncheon gathering at Fort Belvoir on Tuesday, May 17th. We usually gather between 1145 and noon and kick off promptly with an invocation and blessing for our meal. Please note the location – Fort Belvoir Officers’ Club.